I'm sure you've heard me say it before but I'll say it again - I'm a total sucker for highlighting products. My obsession with them is getting pretty close to my love of lipsticks and whenever I'm pursuing makeup counters, my eyes are always drawn to the shimmery champagne highlighters that promise to brighten the complexion and add a much coveted glow to the skin. Other than being beaufiul to look at, I don't feel like my makeup is complete without a slick of highlighter on the tops of my cheekbones and down the centre of my nose. It gives my overall look a more flawless finish and helps me to achieve that Millie Macintosh style glow that we all know and love. 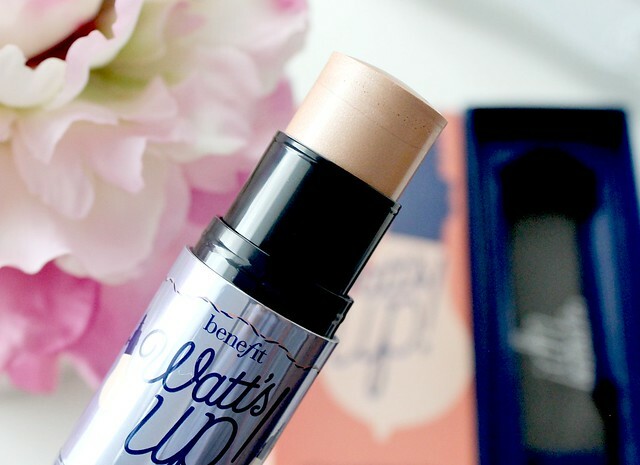 A highlighter I can't get enough of at the moment is Benefit's 'Watt's Up' - a cream champagne toned highlighter that comes in a twist up stick form. 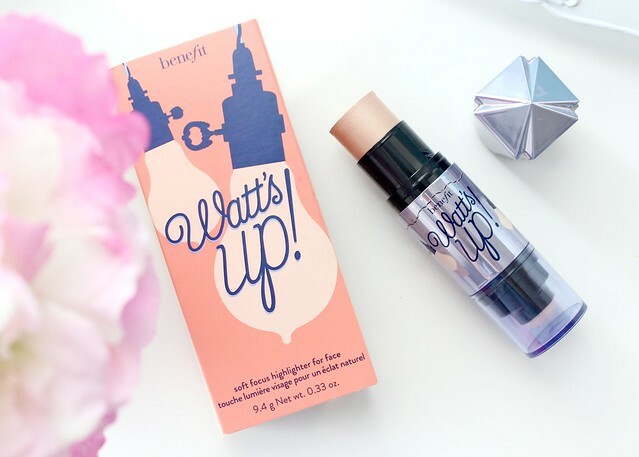 I've always used powder or liquid highlighting products in the past so the cream formula of Watt's Up is unlike anything I've ever before but I may just be converted - its perfect! Firstly, I have to comment on the packaging. As with all Benefit products, the packaging is spot on and the shiny lilac tube is just so pretty. I love that its designed to look like a lightbulb too with a witty name to match - I can see why they've gone down that road as this product really does add light and radiance to the skin. The only part of the packaging that I don't like is the spong blender on the opposite end to the product itself. I attempted to use it to blend the product in and found it totally useless. It doesn't make me like the product any less because I prefer to blend cream product with my fingers or a stippling brush anyway but its worth noting that if you buy this product, don't expect great things from the sponge! As well as looking pretty, the product itself is brilliant! At first I was slightly concerned by the cream formula as I often find cream products look patchy and rub off the foundation and powder applied underneath but luckily, I haven’t had this issue at all with this product. The consistency of the product is very creamy so it glides onto the skin with ease and blends in effortlessly. The pigmentation is excellent too so I only need to lightly swipe the stick across the top of each cheek to get the desired effect. I absoloutely love the champange shade and metallic finish too as it gives my skin that beautiful 'lit from within' candlelight glow without looking too false or glittery. 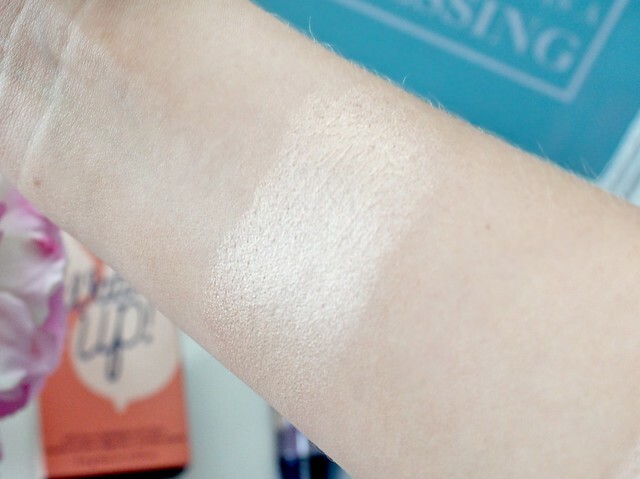 I'd say its the perfect highlighter if you're looking for something that will make you look healthy, glowing and radiant - I've even been using it on my collarbones and down the fronts of my legs as I just love the effect it gives my skin. 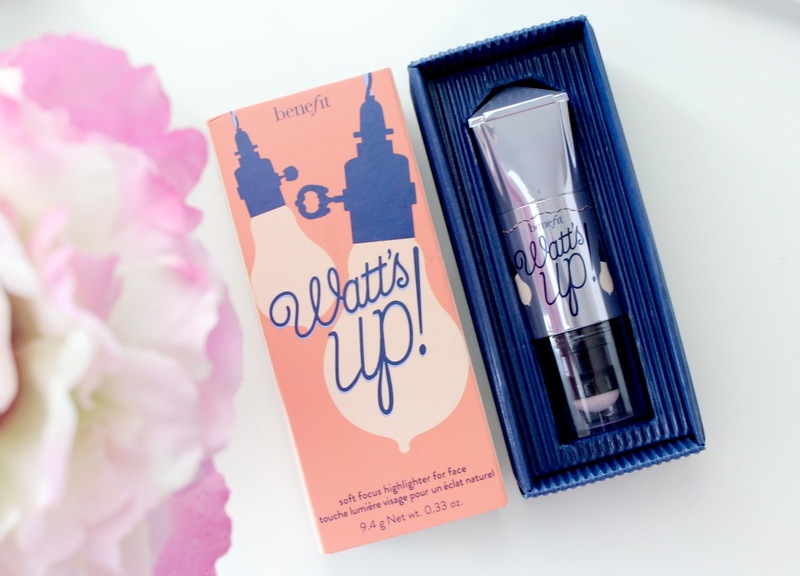 Overall, another great product from Benefit and one I'd recommend anyone to try if you like wearing highlighter or your looking for a product to brighten the whole complexion and add some radiance to the skin. Its available to buy from various online retailers such as ASOS, Feel Unique, Boots, Debnhams and Look Fantastic. The colour looks so pretty! I love this! Great review! Looks lovely, I'd definitely try it out! This has been on my Benefit wish list (and so have the majority of all of their products) since forever, it's so pretty! I LOVE this highlighter! I got it as a sephora birthday gift and I do plan to buy the full size, one day I'll splurge on it. This has been on my 'Benefit - To Try' list forever! I may have to make a cheeky purchase with my Boots points! I was worried this wasn't going to live up to the hype, but I've not heard a bad word about it, think a purchase is in order! Lovely review! I have to try this out! I use this too! I lovvvve it. I reviewed this product a few weeks back. It's bloody amazing! I was eyeing it up for a while after reading so many great reviews and I'm so glad I went ahead and bought it - no regrets whatsoever! I'm with you on the sponge though, not worth being there to be honest; but still such a great highlighter! I have the mini size and I really love it. It's so gorgeous, although I've heard some people really dislike it, not sure why! Ooh this is such a gorgeous colour! I need a new highlighter, mine aren't cutting it anymore. I don't think you can ever go wrong with Benefit! This is probably the first highlighter I ever tried and I love it! I recommended it to all my friends and some of them bought it and love it too! Sounds interesting and I have been loving Benefits products lately. This sounds interesting and even though I don't tend to use highlighters all that much it does seem like something I'll remember to look at if I ever am interested in picking one up. This looks like such a pretty highlighter. I have been to the Benefit counter so many times & never even swatched this. I need to next time. I only have highlighter in powder and liquid form.. will probably give this a try.. thanks for the review! Really want to try this, so pretty! I love Benefit products and this is easy one of my faves! Love this highlighter! I agree that the sponge at the end is totally useless. It just drags around my foundation and messes everything up! I wish they'd get rid of it and just give us more product. Total Benefit addict and snapped this up in sample size in one of their gift set boxes! It's gorgeous but the little sample size is a bit unsteady, feels like the little stick of highlight is gonna snap if I make any sudden movements. haha. following your Beauty-Hair realted sites I am very glad follow me on:-If you are looking for hair styling with the help of hair extensions and looking for Cheap Clip in Hair Extensions then your wait has been over. Different types of hair extensions ranging from Flip in Hair Extensions to I Tip Hair Extensions are there in our website to change your style statements drastically. Best quality Remy Human Hair Extensions is also available in our website for better comfort and feeling. This is gorgeous! I'm a bit of a beauty addict and I'm thinking I may have to run out and add this to my collection!